My mom, as usual, was right. On November 28, 2017, I went to the Joanne World Tour in Atlanta. Buying the tickets way back in January 2017, it hadn’t fully hit me that I was seeing one of my biggest influences until entering the venue. I waited two hours in line and another two hours for the show to start, but it was all worth it as I found myself in the second row of the general admission floor, just inches away from the Philips Arena stage. Was this really happening? When it was show time, a pink countdown clock appeared on one of the huge LED screens, and my heart started beating faster and faster as each second passed. 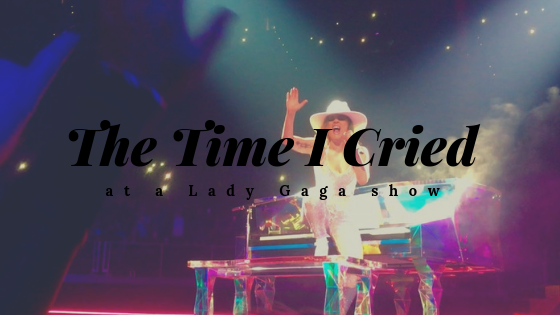 Suddenly, I was taken back to all those moments I spent watching YouTube videos from The Monster Ball Tour, sitting in front of my computer screen, wishing I was one of the screaming fans I heard from my laptop’s speakers. That night, I became one of those lucky fans. Gaga opened the show with “Diamond Heart”, a track off her most recent album, Joanne. As the concert continued, she showed the sold-out crowd everything she can do. She danced, sang everything live (no small feat), played guitar, piano, keytar, all in amazing costumes made of fringe and glitter. This was also the night in which Gaga received her Grammy nominations for Best Pop Vocal Album (Joanne) and Best Pop Solo Performance (“Million Reasons”), which she mentioned a few times throughout the show with gratitude. She continued to thank the crowd, letting us know that we were the reason this happened. I started to cry. I started to think about my passion for music, and hopes of having my songs heard. I started to think about how far I’ve come as a person and as an artist, and the confidence I’ve taken from Lady Gaga to continue expressing who I am through what I create. I started to think about what it means to be a woman in the music industry, the ups and downs, the importance of being who you are. I started to think about how it feels to play the piano and sing my guts out – it’s definitely the best feeling in the world. I didn’t watch the concert through the screen of my phone – I lived in every little moment. Knowing that Gaga would perform “Million Reasons” as the encore, my friends and I left our positions in the front row to move to the back stage, where her sparkling piano was waiting. I cried again, this time because I knew that this dream was ending. I instinctively put my “paws” up, just as I had rehearsed as a little girl in my room, watching the “Born This Way” music video. It is a show I will never forget, and her music has played a huge role in the singer and musician that I am today. Whether I play in front of 20 people or 2,000 people, my goal is to inspire people to be themselves, and to follow their dreams with their fullest hearts. Lady Gaga instilled that in me, and I want to instill that in others. She left me speechless, so speechless.